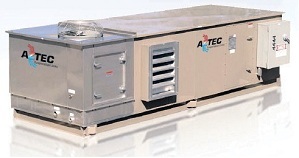 The attached article from Processor Magazine provides a very good description of the benefits of the Aztec ASC indirect evaporative cooling products for the small to medium sized data center. The key product feature that can save smaller owner/operators lots of capital and operating costs is the built-in DDC control system in the Aztec unit. The Aztec DDC provides most of the same functionality as a third party DCIM but without the extra cost and coordination that comes from putting an information/control overlay on top of the data center cooling equipment.